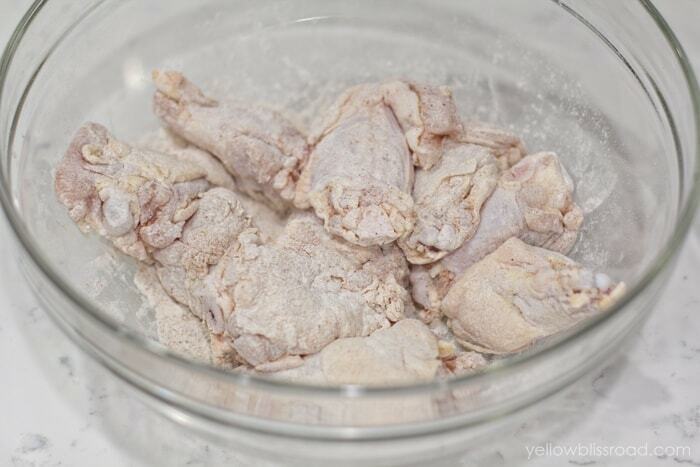 Chicken wings are dipped in flour and spices, then baked until their skin is nice and crispy. 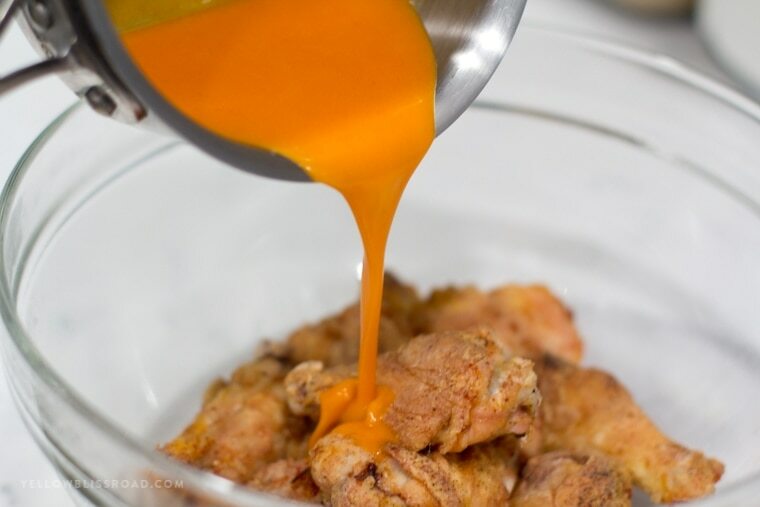 Coat them with some homemade buffalo sauce and your family will devour these Crispy Baked Chicken Wings in Buffalo Sauce as quickly as mine did. They are perfect for game day parties, too! We love all things Buffalo flavored, and will put that delicious, spicy sauce on anything, from Buffalo Chicken Nachos to Cheesy Buffalo Chicken Dip to Buffalo Chicken Pasta Salad. 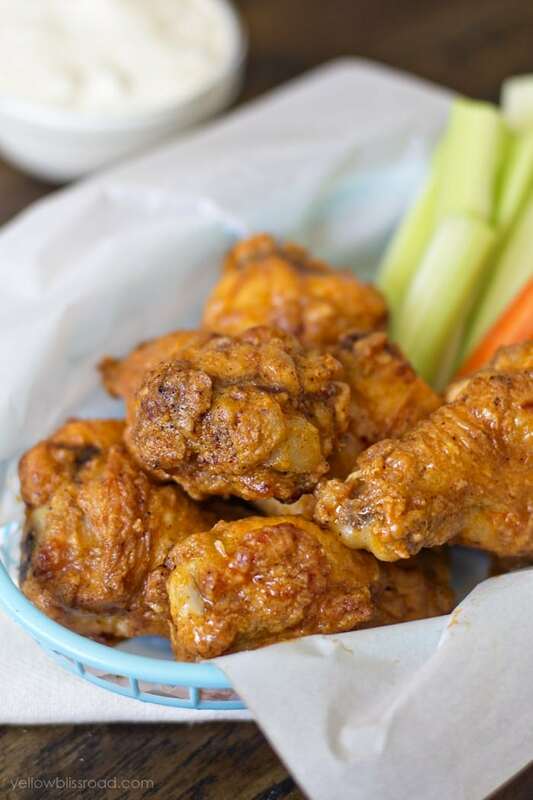 But our all time favorite buffalo wings recipe is the classic Chicken Wings! Chicken Wings have been a guilty pleasure of mine for ages. It’s a favorite snack or even meal when I want to really indulge and get a little messy. 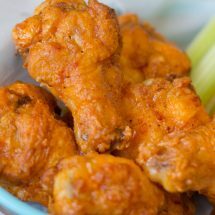 Buffalo Wings like these are a must-have staple for game day parties especially – everybody love them! Well I happen to love them too but I’m a bit of a wimp with the buffalo sauce. The great thing about these Crispy Baked Chicken Wings is you can control the amount of heat but adding more of less hot sauce. We love heading out to Buffalo Wild Wings on hockey night to watch the game and enjoy a big basket of wings. While the kind of crispy chicken wings you get in restaurants are quite tasty, they are also typically deep fried – that’s how they get that crispy skin. Well now you can get that perfect crispy skin at home with my Crispy Baked Chicken Wings recipe! I’ve made chicken wings before, but I’ve never been able to perfect the crispiness until now. The key? Coat them with a little flour and baking powder! I also added some simple spices, but this little mixture coated over the wings made all the difference. They were delicious!! HOW LONG DOES IT TAKE TO BAKE CHICKEN WINGS IN THE OVEN? Preheat your oven to 450 degrees F. A hot oven helps the chicken to cook faster and aids in the crispy skin result that you want. 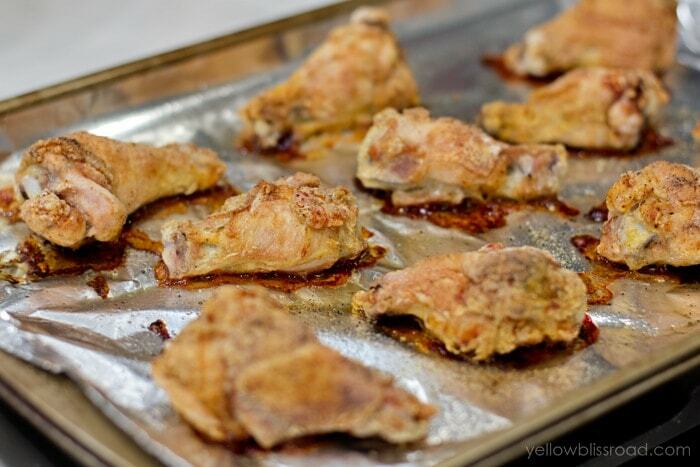 Bake chicken wings for about 30 minutes, or until they are nice and crispy and golden. Cooking them on a wire rack is optional, but can also help with the crispiness factor. 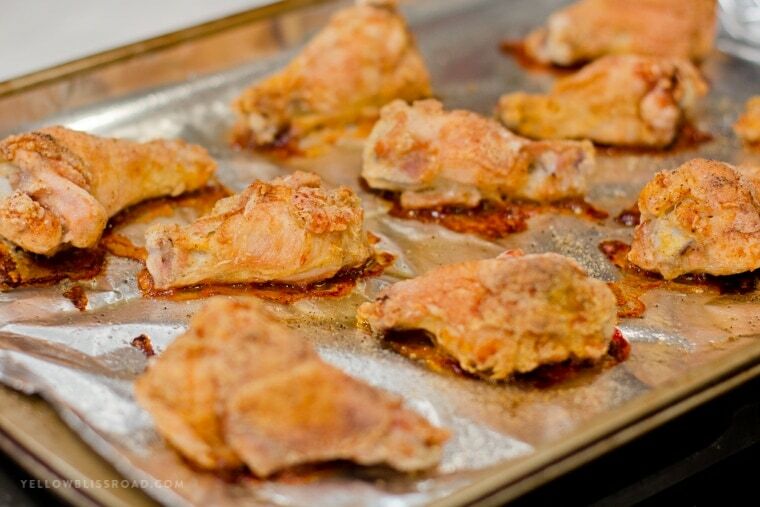 Once the wings are coated in the flour mixture, place them on a foil covered cookie sheet that’s been sprayed with cooking spray (don’t forget this step – trust me!). Bake them in a 450 degree oven for about half an hour, turning them about halfway through. You can also place the wings on a baking rack that you set on top of the baking sheet. You’ll still want to flip them for even cooking, but it might make the skin a little crispier (but honestly, I haven’t seen much of a difference). 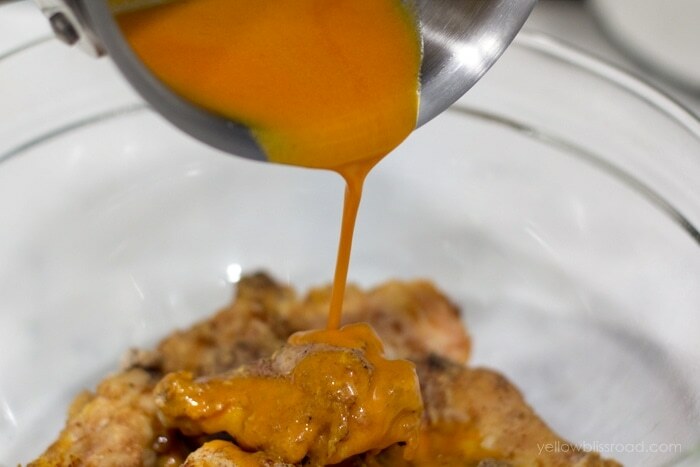 In the meantime you can make your own hot wing sauce, which is basically just melted butter and hot sauce. If your family likes it spicy, add more hot sauce. Alternatively, you could leave the wings unsauced, but what’s the fun in that? If you’ve got some that like it hot and some that don’t, use two separate bowls to coat the wings. Make the sauce more on the mild side and pour some over the wings in one of the bowls. 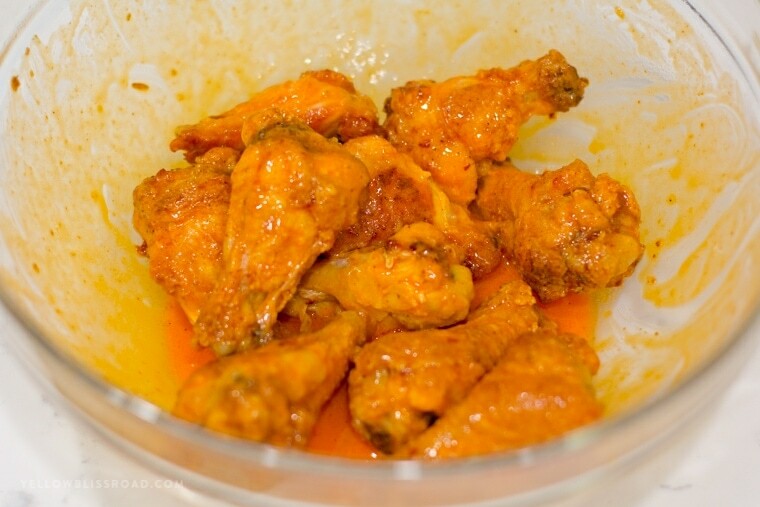 Then stir more hot sauce into the remaining sauce and pour that over the other bowl of wings to coat. Of course you’ll want to make sure you have carrot and celery sticks to help cleanse the palette, as well as some creamy Ranch or Blue Cheese Dressing for dipping. I actually like to mix the two together for a great flavor. *NOTE – A lot of readers have asked if this recipe works with chicken drumsticks. Come find out with my Easy, Crispy, Oven Baked Chicken Drumsticks! Chicken wings are dipped in flour and spices, then baked until their skin is nice and crispy. 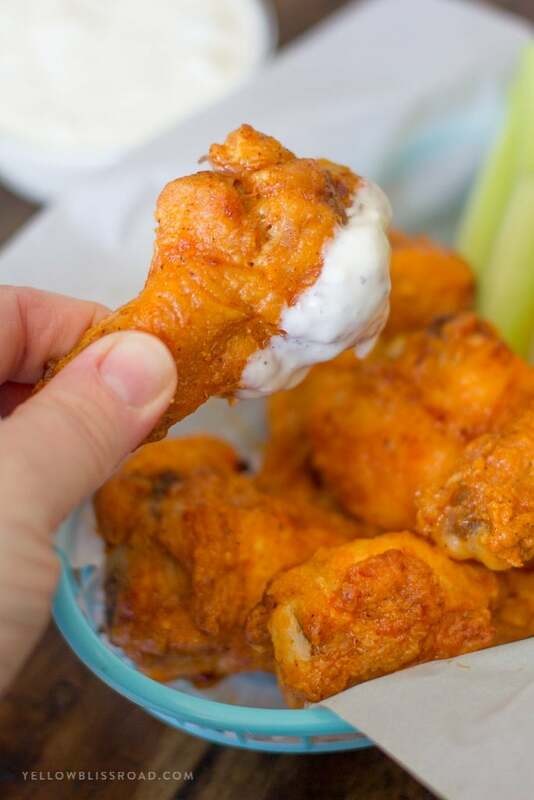 Coat them with some homemade buffalo sauce and your family will devour these Crispy Baked Chicken Wings as quickly as mine did. They are perfect for game day parties, too! Rinse chicken wings and trim any excess skin. Do not remove the skin or you will lose the crispiness. Pat chicken dry. I know you’ve heard this before – but these wings really are so amazing! Crisp and flavorful! Best part – EASY!!! 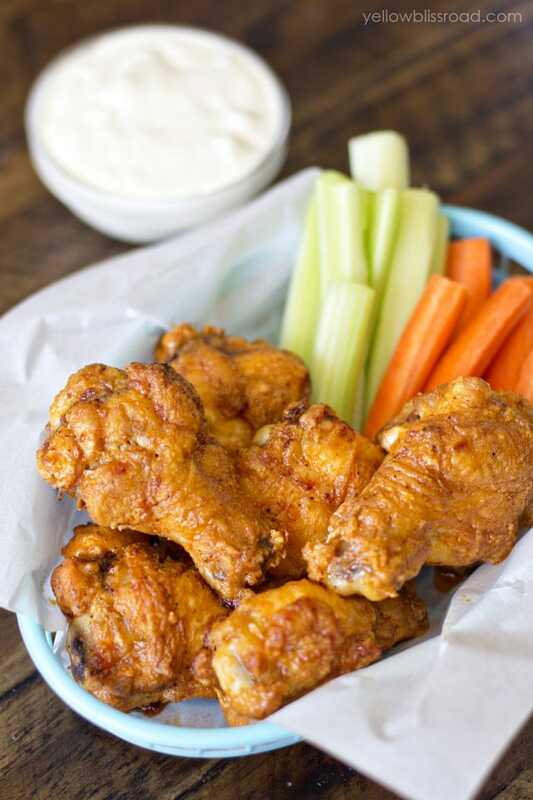 We use a parmesan garlic sauce mostly… But we have done these wings SO many ways and LOVE THEM!! Thank you Lana! this is one of my favorite recipes. Hi, is this recipe really hot? With the hot sauce and chili pepper, I wasn’t sure if this was one of those recipes you need to have with a glass of milk. Wanted to make for family inclusive of a 2yr old. Thanks. It’s as hot as you want to make it. You could set a few aside to keep plain for the toddler, then sauce up the others. Use as much or as little of the hot sauce as you want. Putting the wings back in the oven after the sauce has been applied is a great way to test your smoke detector! 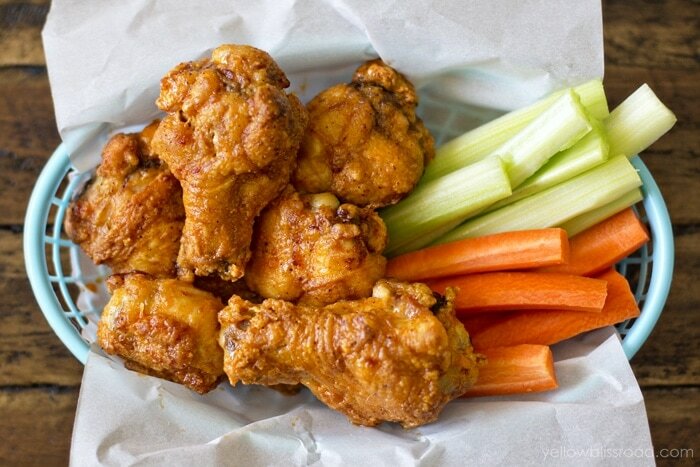 You can make a lot of yummy, crispy wings with this easy recipe. Place around with the spices. Just use the recipe’s measurement amounts for salts/peppers/seasoning. We’ve enjoyed eating these and the drumsticks many times. Yes, you can! Thank you for the review! I have made this a lot of times already. 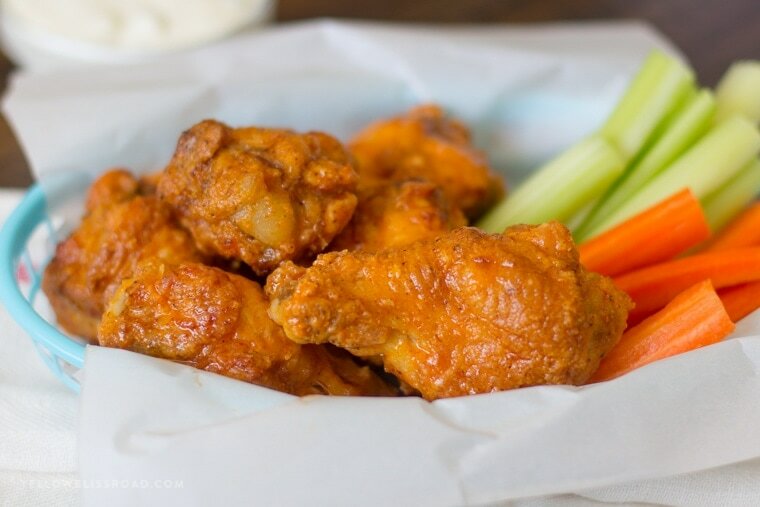 Hands down the best chicken wings recipe I ever tried. I use my airfryer instead of my oven. This is a great and simple recipe! Loved them! They are so good even without the sauce. Thanks for the recipe! Thank you Marry Ann! So happy that you and your family loved this recipe! You wouldn’t even need to use butter. Just coat the wings in your favorite bbq sauce! 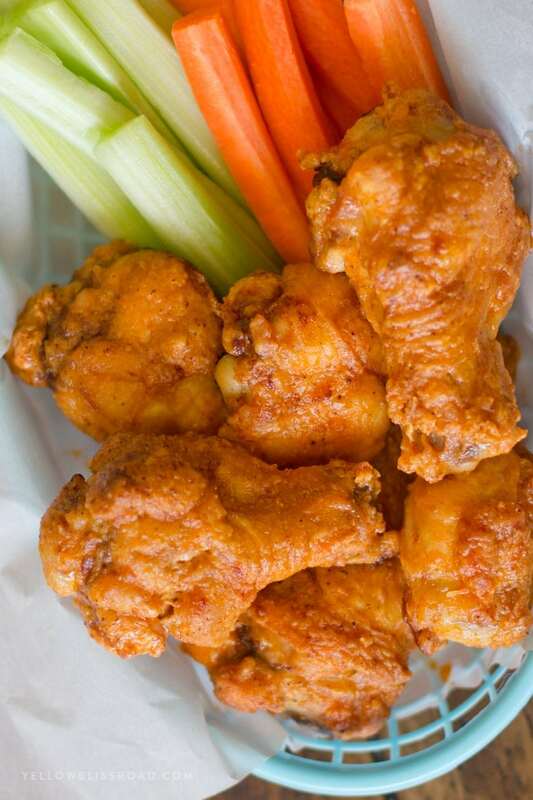 These are saved in my favorites as BEST CHICKEN WING EVER. makes it easier to find. 🙂 Im not allowed to make any other way so says my husband . Excellent recipe .! I made this recipe and halfed it because I only had 11/2 lbs. of wings and it was delicious. I will definitely make again. My husband and I love this recipe….it’s our go to for chicken wings. Thank you. 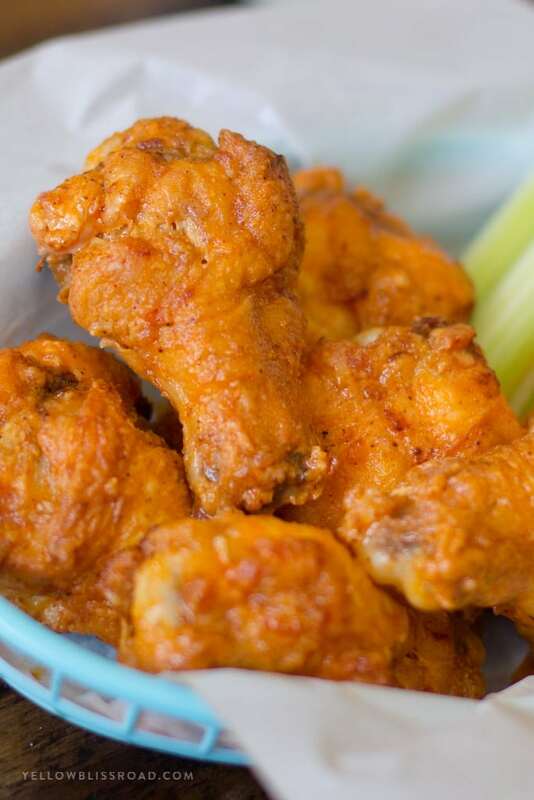 Do you use frozen wings or do you thaw them first? They need to be thawed first.